You have more than one branch of your company? And in other cities? You can also integrate these into your pwa so that your pwa users can quickly find and reach the respective stores. Within this module it is also possible to filter by products or branches. 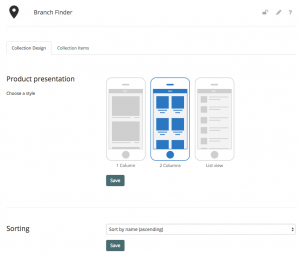 Just like the product catalog module, under design you can specify how your branches are to be displayed in the pwa. You can choose between 1 column, 2 column and list view. On the articles tab, under create product, add your stores. 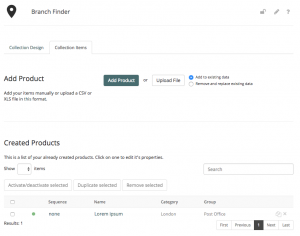 Under created products you can make changes to your entries or delete them by selecting them.